President Abdulla Yameen says he will not resign or negotiate with the opposition despite the threat of mass antigovernment protests on May Day. The Maldivians against brutality coalition says it will bring out 25,000 people on to the streets of the capital on Friday, and has called on president Yameen to initiate talks immediately and free imprisoned former president Mohamed Nasheed and ex defence minister Mohamed Nazim. But the president at a press conference today reiterated his belief that there was no room for negotiations in court verdicts and said ordinary Maldivians are not facing any difficulties in their day to day life. “There is no reason for me to resign. The opposition shouting out what ever they like is no reason for a president to resign,” he said. The criminal court last month sentenced Nasheed to 13 years in jail on terrorism and Nazim to 11 years on weapons smuggling. Foreign governments and international rights groups have condemned the trials for lack of due process. Tens of thousands have signed a petition urging president Yameen to free Nasheed. The opposition leader’s lawyers say the Clemency Act authorizes the president to shorten an inmate’s sentence to any period depending on the circumstances surrounding the prisoner’s conviction. The coalition – made up of MDP, religious conservative Adhaalath Party, members of the Jumhooree Party and independent MPs – says it will end the government’s tyranny on May Day. Opposition politicians have been traveling across the country in recent weeks urging supporters to converge on the capital on May 1. Meanwhile, daily small scale protests are continuing. “May 1 is coming. I will wait and watch. Those who violate the laws must know they will be punished. We have been advising [the opposition] through the relevant institutions. We will not allow [the opposition] to bring out young people and put them behind bars,” he said. He accused the opposition of inciting violence and undermining the rule of law by using religion as a shield, and advised the opposition to cease its efforts immediately. Last week, tourism minister Ahmed Adeeb challenged the opposition to a confrontation on May Day. The government has said Nasheed and Nazim must appeal their sentences, but the opposition says it has no faith in the judiciary saying the president controls the judiciary. The Maldives National Defence Force (MNDF) has dismissed former Defence Minister Mohamed Nazim’s claims of missing weapons from the state armoury. Nazim, currently standing trial for smuggling illegal weapons, claimed an MNDF Special Protection Group (SPG) officer lost a 9mm Browning pistol at Shangri-La resort in 2014. The police had discovered a pistol of the same make and three bullets in a bedside drawer in the then-defence minister’s apartment during a midnight raid on January 18. Nazim has since claimed rogue police officers planted the weapons at his home on Tourism Minister Ahmed Adeeb’s orders. He has requested the Criminal Court to summon MNDF Corporal Ahmed Amir to prove a pistol was lost, and Head of Military Police Abdulla Zuhuree to prove an investigation was carried out over the incident. If found guilty of smuggling weapons, Nazim faces a jail term of ten years. Adeeb said he regretted that the trial was becoming “politicised” and suggested that the ex-colonel’s lawyer, Maumoon Hameed, and not Nazim himself was responsible for the allegations. Hameed did not have any experience in criminal defence, Adeeb said, suggesting that he might bear a grudge for not being appointed Prosecutor General last year. In July 2014, parliament approved Muhthaz Muhsin as PG after PPM MPs decided to endorse the former Criminal Court judge despite the party’s leader, former President Maumoon Abdul Gayoom, urging ruling party MPs to vote for his nephew Maumoon Hameed. The police have also dismissed allegations of framing Nazim. Speaking in court on March 7, Hameed said the basis of the defence was that the evidence against Nazim was “fabricated” in order to “frame” him, alleging that Adeeb – also deputy leader of the ruling Progressive Party of Maldives (PPM) – had planned and orchestrated the setup. Adeeb had threatened to “destroy” Nazim in a conference call with both the defence minister and home minister, Hameed said. The threat came after Nazim lodged a complaint with President Abdulla Yameen alleging Adeeb had ordered police’s SWAT team to chop down all of Malé City’s Areca palms in October. Home Minister Naseer has declined to comment on the threat. Hameed told the press last week that a police forensic report shared with defence lawyers stated that fingerprints lifted from the weapon did not match either Nazim or any of his family members. State prosecutors have also submitted documents on a pen drive allegedly confiscated along with the weapons to prove Nazim had the “motive and character” to use the weapons. The plans indicated the former defence minister was planning to attack President Abdulla Yameen, Adeeb and Police Commissioner Hussein Waheed, prosecutors said. Defence lawyers yesterday named President Yameen, Commissioner Waheed, Chief of Defence Forces Major General Ahmed Shiyam, Home Minister Naseer and several senior ranking police and military officers as witnesses to prove charges were fabricated in a conspiracy engineered by Adeeb. The Criminal Court adjourned the hearing stating the court would decide whether to summon defence witnesses only if they appear to negate the prosecution’s evidence. An Indian aircraft has landed in the Maldives capital Malé to alleviate in the continuing water crisis, as the government reveals it could take between three and five days to restore the capital’s water supply. The first flight landed at Ibrahim Nasir International Airport at 1:15pm, with two additional flights expected to bring a total of 100 tonnes of fresh water for the people 130,000 inhabitants of the Maldives’ capital. Minister of Defence Colonel (retired) Mohamed Nazim has announced that damage to the Malé Water and Sewerage Company’s (MWSC) reverse osmosis plant could mean it is five days before normal service can be resumed. The capital has been without water for 24 hours after a fire at the MWSC caused extensive damage to the reverse osmosis plant, upon which the capital is dependent for desalinated water. Indian Minister of External Affairs Sushma Swaraj has said that Indian Prime Minister Narendra Modi has promised to do all he can to help the Maldives, after pleas from her Maldivian counterpart. A statement from the Maldives Ministry of Foreign Affairs this afternoon has stated tha India, Sri Lanka, the USA and China have pledged assistance. 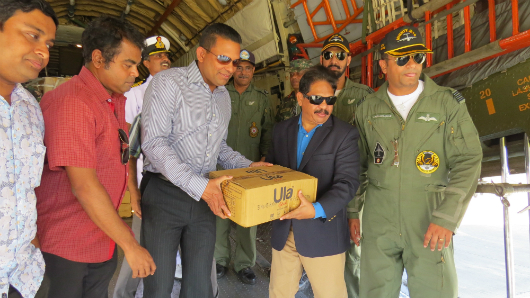 As well as the flight from India, two Indian ships with desalinating capabilities and one from the US naval vessel are headed to the Maldives, while water is being brought on every flight from Sri Lanka, explained the ministry. “The president, the people and the foreign minister of Maldives expresses their gratitude to all nations assisting the Maldives is these harsh times,” read the statement. The Indian High Commission in the Maldives has confirmed that INS Sukanya will arrive in Malé tonight, equipped with two reverse osmosis plants in order to produce water “round the clock”. “Mindful of the strong friendly and close relations between India and Maldives, India reacted with alacrity and promptness to the request from Maldives for timely provision of water,” said the high commission, revealing that the second flight in expected at 3:40pm. 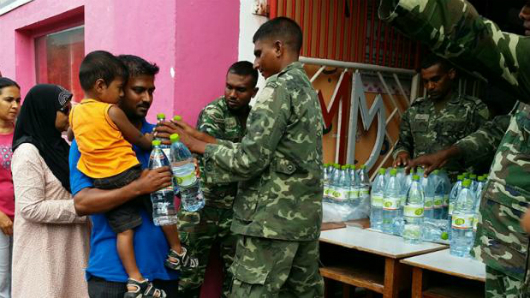 Large queues quickly formed outside shops yesterday evening as the demand for bottled water prompted the government to declare the situation a disaster, with the Maldives National Defence Force (MNDF) giving water away at ten designated distribution points. Home Minister Umar Naseer has said that current reserves have been exhausted, with more fresh water expected from MWSC at 6pm today. Nazim told the press that authorities were confident supply could be resumed for one in every six hours, while the MNDF has told Haveeru that over 77,000 litres had been brought from water plants in Hulhumalé, Thilafushi, and Thulusdhoo. After reports that some shops had drastically increased the price of bottled water, the Ministry of Economic Development is said to have warned of severe consequences for retailers hiking prices. Though some unrest was reported in one store early yesterday evening, police have said no additional incidents were reported overnight, though rumours of some of the capital’s foreign workers being ejected from water lines have spread. Both the home minister and Minister of Tourism Ahmed Adeeb have issued tweets saying that water will be distributed to all without discrimination. Former President and Leader of the ruling Progressive Party of Maldives Maumoon Abdul Gayoom has called upon Maldivians to stay calm until the crisis passes. 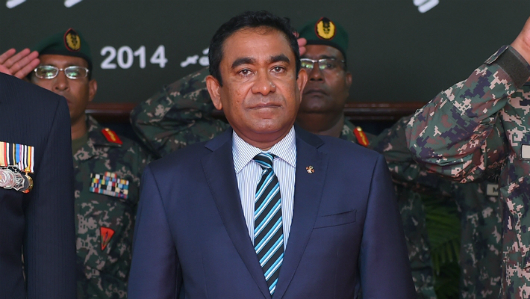 President Abdulla Yameen – currently out of the country on unofficial business – has not yet commented on the situation. Despite an announcement that water supply would be resumed between 8 and 9pm yesterday evening, the only rain many residents received came in the form of heavy downpour just after 8pm. As many rushed to collect rainwater – prompting reports of a rush on the sale of buckets – the Health Protection Authority (HPA) has urged caution. “We request all Malé citizens to take extreme caution when collecting and drinking rain water. All sorts of impurities will be present in water overflow water in roofs. Ensure the water is safe to drink by boiling the water,” Haveeru reported a HPA statement as reading. The home minister – part of a task force of ministers assigned to deal with the problem – has this morning shared pictures of replacement parts being taken to the MWSC, stating that Singapore’s Hitachi company will assist with the repairs. Water shortages have become increasingly common in outlying parts of the Maldives, with low-lying islands unable to rely on contaminated ground water supplies. The crowded capital has long relied on desalinated water, with well-water in the capital unfit for consumption and only utilised for the flushing of toilets in a small number of residences. President Abdulla Yameen has announced that he will personally oversee the Maldives’ health sector until it overcomes its current problems. “When things don’t get done, it is the president elected by the people who has to bear responsibility. But the democratic way is to delegate the work and let others do it. And doing things through institutions and offices,” local media quoted Yameen as saying in Addu City yesterday (August 11). Speaking at a Progressive Party of Maldives (PPM) rally, Yameen alleged that, despite a lot of developments having been brought to the health sector during Gayoom’s administration, no investments have been made during President Mohamed Nasheed’s time in office. The Ministry of Health has been headed by Defence Minister Colonel (retired) Ahmed Nazim after former minister Dr Mariyam Shakeela’s renomination was rejected by the Majlis last month, and had fallen under the oversight of Vice President Dr Mohamed Jameel Ahmed. In an interview with Haveeru earlier this week, Dr Shakeela alleged that she had received threats and intimidation prior to her departure, suggesting that political opponents wished to remove her in order to benefit from corrupt development deals. “When things fail, all the complaints are targeted to the president and in the end it is whoever is elected to the post of president that needs to carry the responsibility for everything,” President Yameen told local media. “Therefore, I have decided that although the sector was not overseen by me previously, I am going to run the health sector directly under my oversight until it overcomes its current hurdles,” he continued. Dr Shakeela – whose time in office was marked by a number of high profile mishaps within the sector – told Haveeru that she had not been provided adequate powers to carry out the changes required. “When I was given the post, some people said this can’t be done by bringing in someone from far outside after we worked hard to bring this government,” she was quoted as saying. The state-owned Indira Gandhi Memorial Hospital (IGMH) – long criticised for lack of qualified doctors and inadequate medical facilities – transfused HIV positive blood to a patient in February due to an alleged technical error. In June, Fuvahmulah councillors called for Shakeela’s resignation after a case of stillbirth, an interrupted caesarean, and the death of a soldier on the island. A few weeks after, over 300 protestors demonstrated in Haa Dhaal Kulhudhuffushi over deteriorating conditions at the regional hospital. Responding to Shakeela’s interview this week, PPM parliamentary group leader Ahmed Nihan told Minivan News that acting minister Nazim was carrying out “tremendous” work in the sector – work he is confident Dr Shakeela could not have done. Nihan argued that the removal of Dr Shakeela was an example of good democratic practice after PPM members became dissatisfied with her performance. On Monday (September 11) the ministry was reported to have signed an agreement with Sunshell Maldives Pvt Ltd for the MVR1.2 million (US$77,821) renovation of Hithadhoo regional hospital. Yameen yesterday also praised acting health minister Nazim’s performance, saying he was “working very actively and conducting some very important work”. He said that Nazim regularly deliberates with him on health sector issues, implementing his suggestions. “I am therefore confident that with the current minister, I will be able to bring about the changes I desire in even the atoll level hospitals,” said Yameen. The president is visiting Feydhoo and Hithadhoo islands in the southern atoll to examine ways in which the government’s development agenda can be implemented. In addition to inaugurate a road construction project in Feydhoo, Yameen announced a land reclamation project to be started on the same island next year, as well as a atoll-wide sewerage project to begin this year. A new e-passport verification system donated by the International Organisation for Migration (IOM) has been set up at immigration counters at the Ibrahim Nasir International Airport (INIA) and the foreign labour section at the immigration department, reports local media. Speaking at a function at Hulhulé Island Hotel yesterday, IOM Programme Manager Alia Hijree explained that the system could be used if an immigration officer feels suspicious about a passport or visa, adding that the process would only take 19 seconds. “In this short time we verify the details about a suspicious person, to match those details stored on the electronic chip of the e-passport. The system will find how much the details match. In addition to this, the system will be able to check the type of ink used in the passport along with several other details,” she was quoted as saying by Haveeru. Defence Minister Colonel (Retired) Mohamed Nazim meanwhile said the Maldives was targeted by smugglers while the threat of terrorism was a major concern in the region. “Today criminals are more organized, technologically more capable, and increasingly operate across the borders. The threat of terrorism is a major concern in this region,” he was quoted as saying by Sun Online. Counter-terrorism measures are being implemented to strengthen border control, he added. The US$7 million (MVR118 million) renovation of Malé’s Indhira Gandhi Memorial Hospital (IGMH) is set to end the concerns of patients with no choice but to use the capital’s only public hospital. Following yesterday’s announcement, dissatisfied users of IGMH – a gift from India – have told Minivan News that they are currently forced to use its services due to the lack of reasonably priced alternatives. “The state should be able to offer better and more reliable services than this,” said Ahmed Arshad whose father recently passed away while on the hospital’s waiting list for a bed. “While I am deeply displeased with the services there, I go there because there is little other choice,” said Shahid Ameen, 35. According to a statement issued by the hospital’s management, the plans – which include a new 11-storey wing – represent the first major development undertaken since the hospital’s construction 19 years ago. Plans also include renovation of the hospital’s infrastructure and the upgrading of the Villimalé Health Centre to a 15-bed hospital. IGMH’s new wing – set to be finished by December – will be dedicated to prenatal care and paediatrics and the current dialysis centre expanded. In his capacity as acting health minister, Minister of Defence and National Security Mohamed Nazim has also announced that the government is seeking to employ 225 additional doctors, who will enjoy revised pay structures – the details of which are yet to be revealed. Aishath Inas – a 28 year old teacher – welcomes the proposed development, noting that it is currently “very difficult and time consuming” to get services at IGMH. “There are long waiting lists even to get a bed in the ward, and people need to wait days to get the medical attention they seek,” she said. Shahid Ameen noted that the current facilities were hard to locate, despite saying he frequently visits the hospital. “As for getting appointments with specialists – especially those in the Internal Medicine or Orthopaedics department – well, better to just forget about it. You have to stand in queue for hours, sometimes even days, before you can get an appointment,” he said. 61-year-old Shaheeda Mansoor says she avoids going to the hospital if at all possible. “It costs a bit more, but it is worth the money to go to clinics instead as you can get faster, and more quality services there when it comes to consultations. However, I still go to IGMH to do some tests as those services are rarely available in the clinics,” she explained. Indian company Renaatus Projects Pvt Ltd will be undertaking the development work which commenced on May 18 and is estimated to be completed within 15 months. Under the project, the in-patient wards, attached bathrooms, the Intensive Care Unit, operation theaters, labour rooms, emergency room, and the hospital’s basement will be renovated. Equipment worth MVR4.5 million (US$291,451) has been donated to the dialysis centre by MedTech Pvt Ltd and Medicom Pve Ltd while a special consultation room will be set up for a recently-recruited specialist in kidney related illnesses. The new Villimalé Hospital will contain a three-bed labour room, an operation theatre, five consultation rooms, and an emergency services room. Nazim – who local media reports to be currently heading the Ministry of Health – announced that the state is looking specialists across numerous areas of expertise, including anaesthetists, cardiologists, dermatologists, gynaecologists, paediatricians, and psychiatrists. At the press conference, State Minister of Health and Family Hussain Rasheed said that the state will complete the hiring of doctors within 45 days, with 91 medical officers to be placed in health centres across the country and specialists assigned to atoll and regional hospitals. The government today announced a massive operation to detain and deport undocumented workers. “Within three to four months the whole Malé will be cleaned,” said the Minister of Defence and National Security Mohamed Nazim – also in charge of the Immigration Department. Nazim told media the government is planning a “very strong operation” to reduce the number of undocumented migrant workers in Maldives “for the safety and security of everyone and for the economy”. He said the operation would be carried out jointly by Maldives National Defence Force, the Maldives Police Service, the Department of Immigration and Emigration, and other relevant institutions. Those detained in the operation are to be be deported using the money deposited by their employers when they were recruited. A special facility has now been assigned to keep those who will be detained in the operation. Local councils will implement the operation in the atolls. Nazim said the operation will begin before Ramazan and will target all undocumented workers – from those at the local market, to those wiping motorcycles. Those deported will have to wait 5 to 10 years before being allowed to enter Maldives again, as opposed to those recently deported through a special voluntary repatriation program, who have the option to return in six months. The defense minister noted that the capacity of institutions will be considered when carrying out the operation, as the government “does not want to detain so many people and take care of them”. Actions such as imposing fines and restricting quotas will be taken against those who employ such workers, while a public awareness programme will be carried out simultaneously. Nazim today announced that, within the year, the recruitment of foreign workers will be limited only to employment agencies. In this regard, quotas – the maximum number of foreign nationals that can be employed by a single employer – will be issued only through employment agencies. “Instead of individuals requesting for a quota, they should go through [recruitment] agencies to get the quota. They should apply to agencies and do it through those agencies,” he said, noting that individuals can still employ foreign workers, but can also only do so through agencies. Nazim said the main reason for the change is the current difficulty in holding individuals accountable. When the government allowed individuals to recruit foreign employees directly, in 2009, the Association for Employment Agencies expressed concern that the move would increase the number of undocumented workers. In addition to the approximately 110,000 migrant workers employed in the Maldives, the number of undocumented workers have been estimated to be as high as 44,000. Many workers live at congested labor quarters owned by locals. Authorities reported a good response to the recent voluntary repatriation scheme, with over 4,000 workers reported to have left the Maldives between December and the end of March. Meanwhile, the Maldives Inland Revenue Authority (MIRA) today announced that, starting from Sunday, immigration related payments such as the visa fee and fines will be collected from the newly established ‘Huravee Collection Center’ on the third floor of the Huravee Building. Commissioner General of MIRA, Yazeed Mohamed said that similar collection centers will be established around the country to make such payments easier. And said that the authority is working to establish a tax collection center in Hulhumale as well.